While Pierce Atwood is now a regional multiservice law firm of 160 lawyers with offices throughout New England and in Washington D.C., our historic headquarters is in Portland, Maine, where we offer a full array of legal services to our clients, including environmental law, business law, energy law, real estate law, and more. We are proud of our roots, but just as proud of the foundation they have provided us in building a firm with practices and practitioners that are nationally and internationally recognized. We are very excited to be located in a historic building on Merrill's Wharf that was built circa 1840. The project to rehabilitate our offices was truly unique and has revitalized not only a proud old building, but a portion of the Portland waterfront as well. We hope you will come to visit us soon. Pierce Atwood was a founding member and is a continuing supporter of the Frank M. Coffin Family Law Fellowship, which funds three full-time attorneys who provide a full range of family law services for low-income individuals. Our attorneys and staff also serve on or advise numerous non-profit, civic, and school boards, such as the Maine Justice Foundation and Pine Tree Legal Assistance, and provide services to a host of non-profit and charitable organizations, such as the Animal Welfare Society and the Augusta Food Bank. Pierce Atwood proudly supports The McKusick Diversity Fellowship, a program at University of Maine Law School that provides tuition and other support to students from socio-economically disadvantaged backgrounds. The firm offers McKusick Fellows the opportunity for a paid internship at the firm. Please visit our pro bono and community services pages to learn more about Pierce Atwood's charitable activities. Continue on Commercial Street. Our office is on the right. Fore Street Garage, 427 Fore Street. 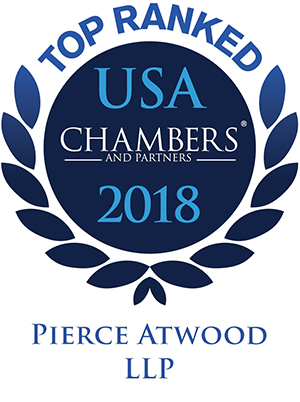 Pierce Atwood received 37 attorney recognitions in practice areas across five firm offices, and is the only Maine firm to be recognized in Band 1 for environmental law and general commercial litigation. Click here to view all 2018 rankings.